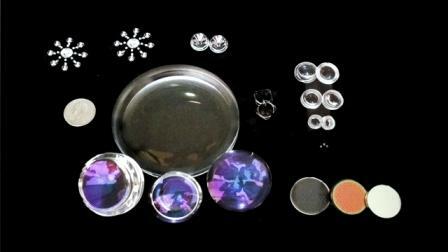 Syntec Optics has developed thin film technology for plastic optical systems. Thin film technology is a process by which very thin layers (nanometers in thickness) are deposited on a substrate. Electronic semiconductor devices and optical coatings are the main applications benefiting from thin film deposition. There are two main techniques used to deposit thin films, purely physical, such as evaporative methods, or purely chemical, such as gas- and liquid-phase chemical processes. (There are also a few techniques that use a combination of these methods). Electron beam evaporation is the most versatile means of vacuum evaporation and deposition. This technique allows the production of thin film coatings from pure elements, including most metals, as well as numerous alloys and compounds. Electron beam evaporation offers several advantages over competing processes, including: precise control of low or high deposition rates; excellent material utilization; co-deposition and sequential deposition systems; and, a uniform low temperature deposition. Use of electron beam offers higher evaporation rates, freedom from contamination, precise rate control at very low deposition levels, precise film composition and cooler substrate temperatures. This last attribute is extremely important for coating plastic optics. From chemical deposition like plating, CSD, CVD to physical deposition like thermal evaporation, sputtering, pulsed laser deposition and Arc-PVD, connect with us at SyntecOptics.com.